As used on Williams PinBot and JackBot pinballs. 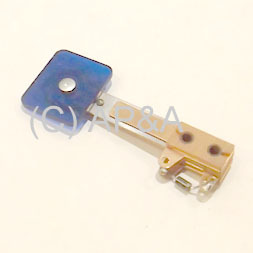 Rectangular transparent blue target with no mounting bracket- used in the elevating visor target bank. Target face measures 1-1/16 x 7/8 inches and mounts directly to target bank assembly (mounting hardware not included). Also replaces # SW-1A-163-1. Wires must be connected with correct polarity- green wire(s) will go to empty solder lug, and white wire(s) will connect to solder lug with diode's anode (non-banded) end.